The balalaika is a wooden, three-stringed instrument of Russian origin, with a characteristic triangular body. The balalaika is played by strumming and plucking with the fingers of the right hand. An important part of balalaika technique is the use of the left thumb to fret notes on the bottom string, where it is often used to form chords. 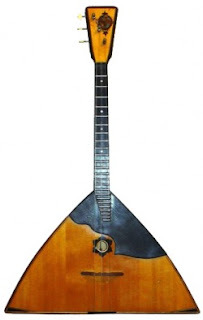 There are many theories about the origins of balalaika and how it developed into it’s triangular shape. In any case, the first written record was in 1688. The balalaika was supposed to be invented by peasant serfs to relieve their hard living under cruel landlords. Gradually the instrument spread among peasants and skomorokhi (wandering minstrels and jesters) who traveled all around the vast expanses of Russia. Skomorokhi performed at fairs, using their ballads to poke fun at church and state. Tsar Alexei Mikhailovich issued an order to burn all balalaikas, domras, horns and guslis, or punish those who would not yield. Although the repressions ended with the Tzar’s death, balalaikas did not achieve their former popularity until the mid 19th century, with Vassily Andreyev, a violinist, composer and arranger. One day as Vassily Andreyev, a young nobleman, was walking in his estate he heard his house-serf playing the balalaika. He was astonished at the unusual sounds of the instrument as he considered himself a connoisseur of Russian folk instruments. He began to learn how to play it and realized how much potential the instrument held. He set to work perfecting and standardizing the balalaika and even went to St. Petersburg to ask the violin master Ivanov for advice. At first Ivanov refused to make a balalaika, but after listening to Andreyev’s masterful performance, he could not resist. It was long, hard work but eventually they created an improved balalaika. Andreyev’s vision was to bring the balalaika back to the folk and popularize it. On his initiative all the soldiers serving the army were given balalaikas which they took with them after retiring from the army. In this way balalaika again spread all around Russia and became a popular instrument. With the help of master instrument makers, Vassily Andreyev created a family of balalaikas, like in a string quartet. There are six sizes - piccolo, descant, prima, secondary, alto, bass, and contrabass. These instruments formed the basis of the Great Russian Orchestra, which later toured in many countries of the world to glorify the balalaika and Russian culture. The Russian folk music instrument treschyotka is a kind of rattle which produces a variety of percussion sounds. It is formed from many wooden slats threaded together on a string. 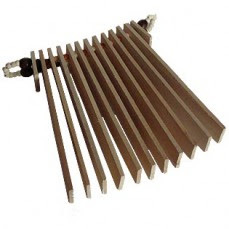 Treschyotka should be made of completely dry wood, preferably oak – this is what provides musical qualities of the instrument. In order to produce diverse sounds and rhythms, hold the string, stretch it like an accordion, then then squeeze the slats together. Try with different forces and vary the angle of the slats. From ancient times, Eastern Slavic people used percussion instruments for war, hunting, in rituals, for singing and dancing. 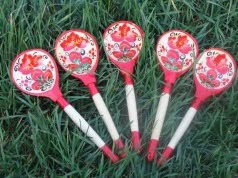 In the 19th to early 20th centuries, choirs and folk instrument ensembles used spoons in elaborate stunts. Spoon players performed solo, accompanied singing and dancing, or were part of various ensembles. Musical spoons are made of harder wood than regular table spoons, often have longer handles and the ladle part has a polished surface. Sometimes jingles are attached to the handle. A set of spoons can have 2, 3 or 4 spoons of a different sizes in order to create different pitches. There are many techniques and tricks for playing spoons. To play them put two between the fingers of your left hand, and hold the third one in your right hand. Hit the first two spoons with the third one. Slide each strike from one spoon cup to another, then clap the two left hand spoons together. 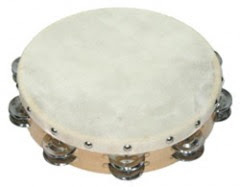 Buben, or tambourine, is a hand-held percussion instrument with a narrow round frame and a membrane (rawhide or manmade) stretched over one side. Little bells, or pairs of jingles may be attached in the slots of the frame. Buben were widely used by skomorokhi (wandering minstrel-clowns) and bear tamers. Virtuoso buben players did all sorts of tricks: they could toss it up in the air and catch it, bang it on their knee, head, chin or nose. Of course they beat it with their hands, elbows, fingers, shaking and rattling it, all while singing and dancing.